For a person who really didn’t like hanging Christmas lights when he was a child, Chuck Downs has made a big turnaround. 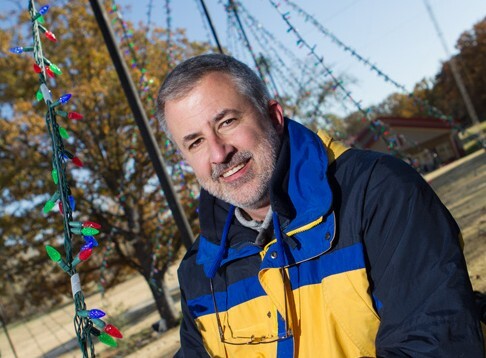 His family’s holiday lights display in Norman has become such a huge event that it was featured in ABC’s Great Christmas Light Fight in 2013. 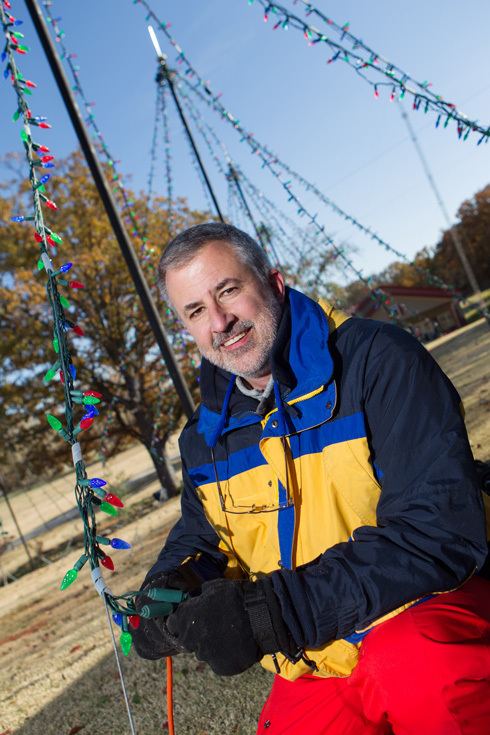 Chuck Downs is ready for another year of dazzling holiday lights at his Norman home. Photo by Brent Fuchs. Downs enjoyed participating in the show, but says it was hectic. “It really didn’t seem like a competition, but was geared more towards showing the TV audience how crazy ‘Christmas people’ like us truly can be,” he says. “Crazy” is debatable; “charitable” is not. The Downs family’s light display has raised money and food for the Regional Food Bank of Oklahoma since 2008. That first year, guests contributed enough canned goods for 8,201 meals and $598 in cash. Last year, the Downs family turned over more than $38,000 in donations (thanks to matching funds from Chesapeake Energy) and 9,588 pounds of food. Since the Downs family began collecting for the food bank, the funds and food contributions to date have produced 911,695 meals. This year, the Downs family hopes to break the one-million-meals mark. “We want to provide an outlet in which our community can come together and help one another during the holiday season,” he says. The Downs’ lights display features more than 280,000 lights, 18 miles of light strands and 13 miles of extension cords. In the yard, 70-feet-tall trees are lit with light strands weighing in total around 800 pounds. All the lights and features are synchronized by software and hardware controls spread throughout the yard. Plus, there’s music. 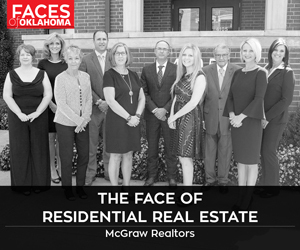 attracts onlookers not only in the local community and Norman, but visitors from around the region. Although his childhood Christmas displays were nothing like what Downs puts on now, he says he and his family have grown to enjoy the extensive task and surpassing expectations. They also like to see what others create each year. The Downs Christmas lights display switched on Nov. 27 and runs through Jan. 3. The display is on from 6 p.m. to midnight every night (except on New Year’s Eve, when the display runs until 1 a.m.). The Downs home is located at 2900 72nd Ave. SE in Norman. As always, onlookers are asked to bring canned food items, which will be donated to help fellow Oklahomans.